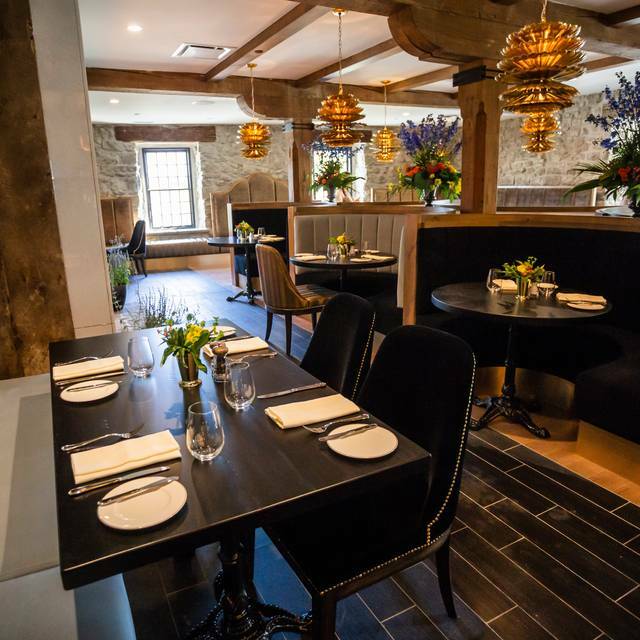 Parking for Elora Mill Restaurant is located at 24 Carlton Place on the South side of the river. 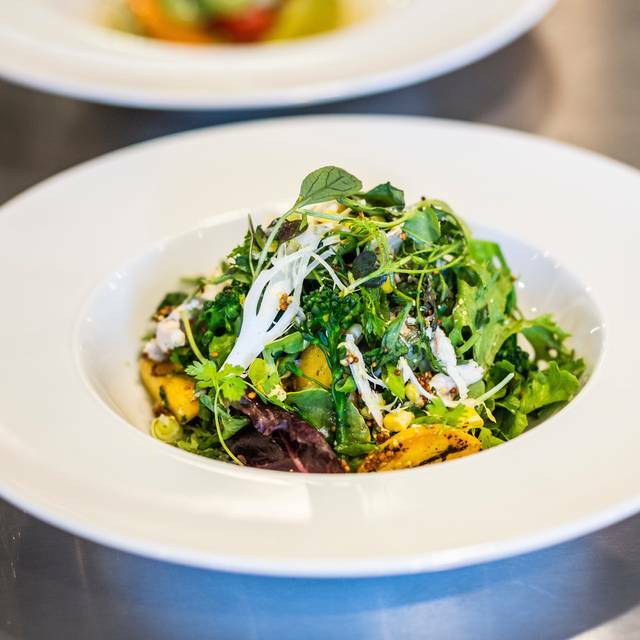 Delight in a menu that changes in tandem with the seasons to offer dishes ever inspired by freshness and locality. 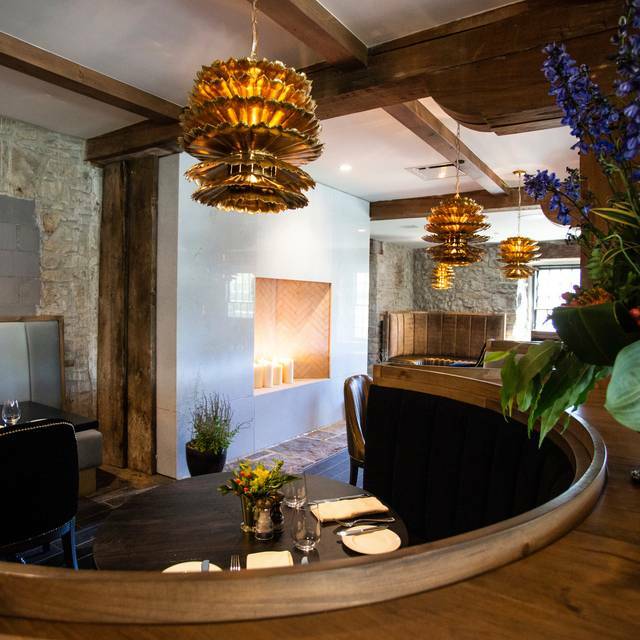 Drawing inspiration from the indigenous bounty of local fare, the essence of Elora Mill Hotel & Spa's food philosophy is heightened by an uncompromising aesthetic and exceptional service. Our Chef's Table is an experience deserving of anticipation, one that breaks down barriers and puts the creative process on full display. 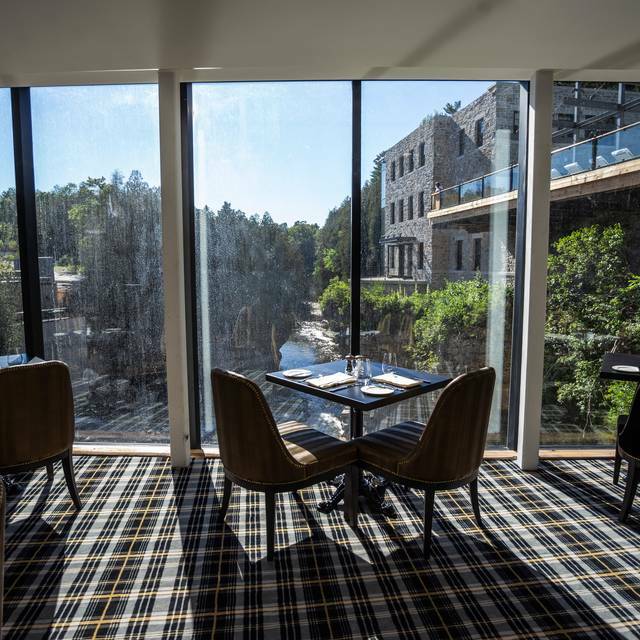 Dining at Elora Mill Hotel & Spa is anything but ordinary. A wonderful and memorable family Easter morning brunch experience. Ambience is warm, inviting and upscale. The natural surroundings and incorporation of old stone, wood and the mill race is spectacular. Hats off to the designers of the renovated spaces and the special touches this property offers. But what stood out the most was the personal and impeccable first class service. Thank you to the Mill staff and chef for such a wonderful experience. We will be back! Incredible environment. The restaurant is beautiful and the view is spectacular. They were very accommodating to my vegan diet and the food was delicious. We will definitely go back. 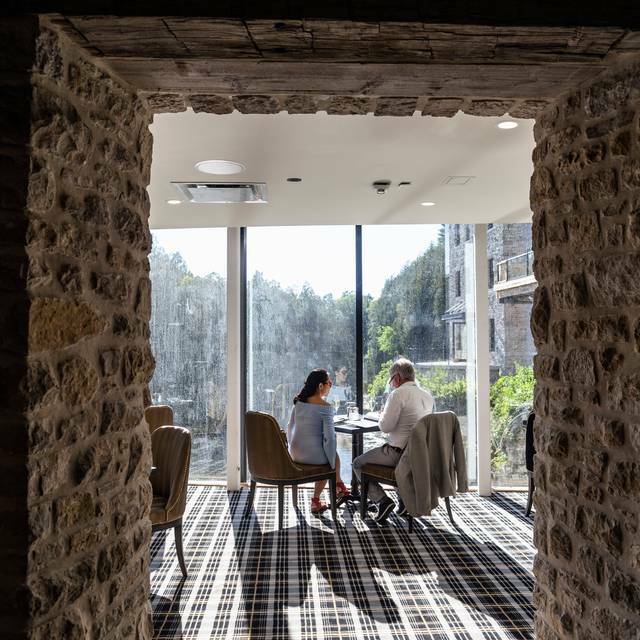 Our dining experience at the Mill was a memorable one celebrating a special birthday, delicate food and drink overlooking the rushing gorge:) Service was amazing and the atmosphere was perfect for our special occasion. We did bring to our servers attention however that our beautiful steak feature we ordered sadly did come out overcooked to what we specified. We order a medium rare 18oz wood fired steak cut and it was slightly over medium cooked. The kitchen and staff were excellent in handling the mistake and made us a fresh perfectly cooked medium rare steak! They thanked us for being honest in how we felt and we can't wait to dine again there! The waitress, Elisa, was very helpful. The food and the overall experience were great. We were not rushed and enjoyed the view and the ambience. The chicken pot pie I ate was like an ordinary chicken fricassee spooned onto a plate with a puff pastry round on top. The portion was rather small. It tasted fine, but certainly not anything I could not get in many less expensive venues. The bread was excellent but I prefer sweet butter rather than whipped butter which contains shortening. My husband had the burger which was made of good quality meat but the toppings were not very creative - he wished it was more flavourful. The restaurant itself has a good ambiance but since we were not seated near any window we did not get enough out of it. If I were seated at a window the extra cost may have be worth it. Beautiful setting. Great and welcoming service. Food was very fresh and tasty. Good presentation. Waitress was very attentive. We enjoyed the afternoon and lunch, definitely we will return. 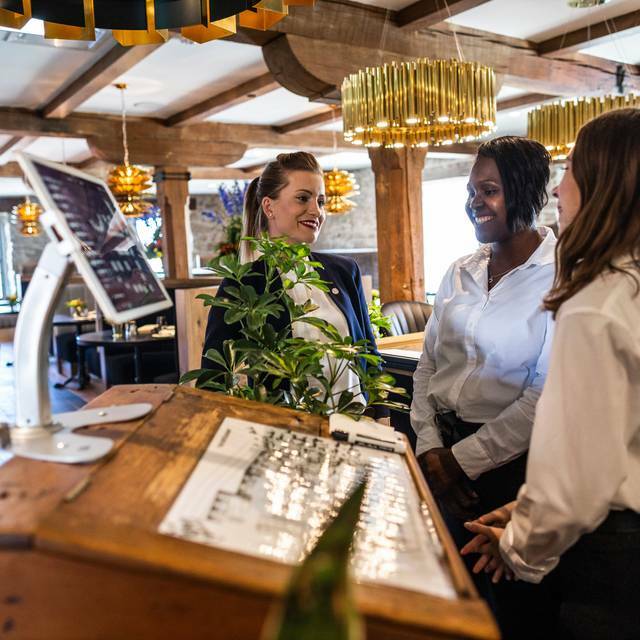 The service was very good, however I asked a couple of times for a refill of coffee, it was a long wait, as well as our guest asked for tea at the end of the meal and waited as well, we were about to ask for the bill when it arrived. I know it was busy but that is not a small thing. The setting is so beautiful, but the food was really disappointing. Most of our party of 5 had the skirt steak with the artichokes. It is served looking like a brown mess on the plate. The menu is not very extensive. Everything offered seemed to be charred, smoked, overcooked or burnt. One of our party asked if he could sample one of the beers offered to be told that "it is just a standard beer". No sample was forthcoming. The dessert was served so quickly that the server slammed into one of our chairs and two of our guests had to duck or be hit in the head by plates. Why? I was looking forward to the Blackberry and cream dessert. What arrived was not tasty and unrecognizable from the original ingredients. The Burrata was delicious but why was the bread it was served with burnt? There were no good vegetarian options on the menu and nothing special was offered. The peach cocktails were all water and ice on the top. We were celebrating and hoped to have a nice experience. We don't mind paying for a nice dinner, but the food should be tasty and the service reasonable. Food was small portioned. We expected afternoon tea as it was on website. Staff were reasonable but not exceptional. Site is beautiful. Incredible in their attention to detail in both service and food. Not pompous but somehow extremely fine dining with a comfortable and aesthetic atmosphere. The perfect restaurant experience, will be coming back. Celebrated our anniversary here. Good food, great venue. You have to go at least once. The food, service and ambience was excellent. A bit pricey for the lunch menu. My only complaint (and I've said this before) is that the pot pies should come with something else --- a handful of salad, a couple of nicely ripened tomato slices, a few sprigs of herbs -- they are "lonely" all by themselves on the plates and need a touch of something to make them a complete meal instead of a snack. The food is beautifully presented except for the pot pies which look like grandma's kitchen table lunches. Absolutely enjoyed our first visit and hope to make this a regular place for date night. Terrific! The food was as amazing as the view! My boyfriend and I had dinner at the Elora Mill on Friday night. The ambience was so lovely. The staff was amazing and so focused on pleasing the clientele. We felt so comfortable and the view of the river with the falls was beautiful! We would definitely return as we had a wonderful time. A wonderful dining experience against a stunning natural landscape. Great service as well as an interesting menu to peruse. Excellent food, close to perfect. Outstanding expertise in wine. If only the waitress had left a bit covering the bottom of the bottle instead of pouring the last drop. Very expensive but understandably so. A wonderful evening - our waiter was fantastic - friendly - made some great wine suggestions (which we absolutely appreciated). Love what you have done with the renovations. Will definitely be back. Beautiful setting. Loved the view and the ambience. I really liked my pasta dish. My guest ‘a frittata was dry and not up to par for the 19$ price tag. Service person was very sweet, however , maybe not as attentive as they could or should have been. Training insufficient?we had to ask for sugar for the coffee ( did not bring with the cream) and had to ask for refill of coffee. Did not come around as much as could have. All in all would recommend. We dined in the solarium. There was a particularly boisterous crown, which made it difficult to carry on a conversation with my dinner guest. Kinda spoiled what would otherwise have been a really nice dining experience. 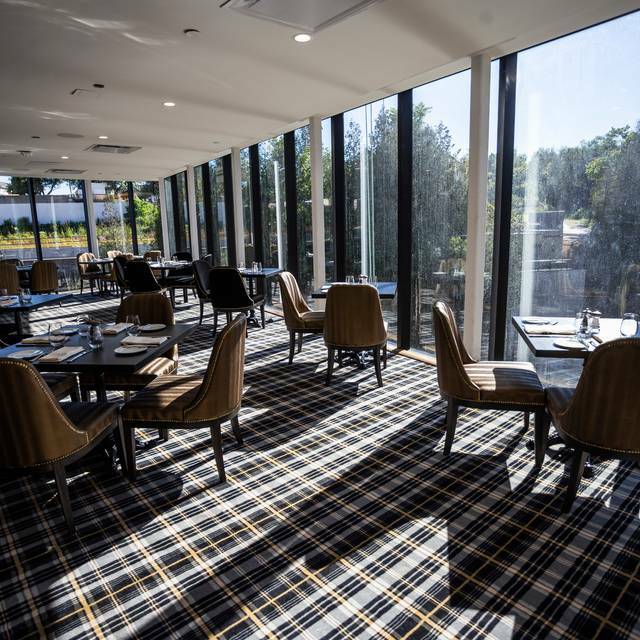 We had a very good dining experience ,we are planing to attend a dinner as we have had 2 lunch experiences .This was my daughters first time at the restaurant and she was very impressed . 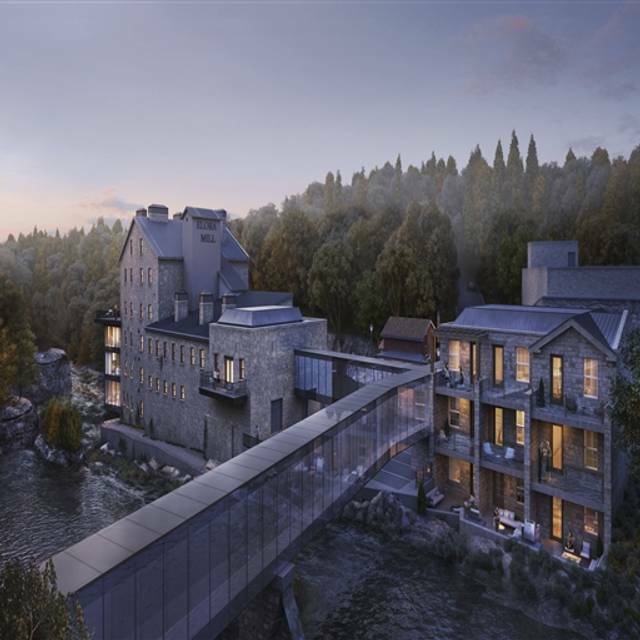 The view, ambiance, and overall style of the mill is breath taking. We had dinner on a Saturday night and the flowing water with its light show captured the beauty of this hidden gem. Our drinks were on point, the sangria had a delightful bite and the beers on tap were fresh. The reason for my low review is a direct reflection of the food. The steak was soaked in oil, which my spouse later had an upset stomach from we believe and my pork was perfectly cooked but it’s compliments were lacking. We likely will not return for dinner, but may stop by for drinks again. Our waiter enjoyed poking fun in a great way at our questions regarding the menu. 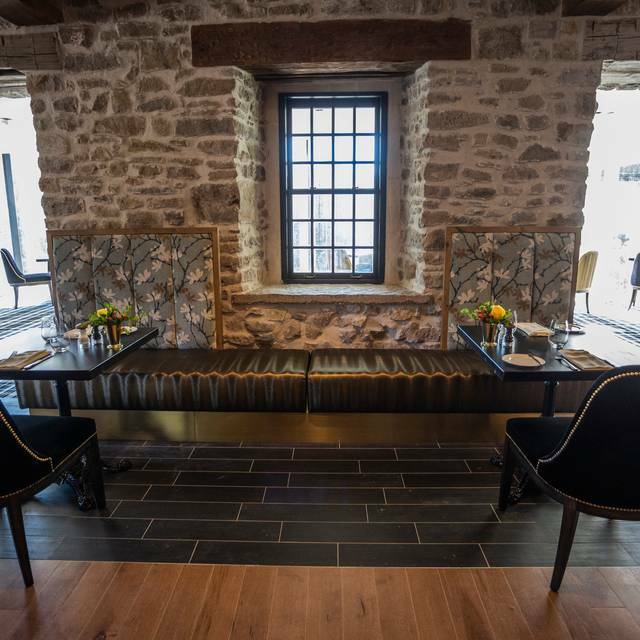 The newly renovated Elora Mill is gorgeous. It is beautifully decorated and views of the river are stunning. The staff was extremely friendly. Unfortunately I have one big BUT...the food wasn't up to par! I had the snapper and asked that it be done dairy free and it came swimming in olive oil. The portion size wasn't enough either, some rice or more veggies would have been nice. My husband had steak and it came with three tiny potatoes and NO veggies. I would go back to enjoy the food and I would order from the pub menu. The service was wonderful but the frittata was terrible. The ambience was beautiful. Food and service were excellent, waiter was very helpful. Enjoyable experience all around. Beautiful restaurant and little town. Food was amazing and decent size portions for the price. I would definitely recommend going here. My only suggestion is to maybe add a daily special additional to their regular menu. Everyday they have 1 new item that's different than what's on the menu to try to get people coming back multiple times. The experience at the Elora Mill was excellent overall. The team accommodated our special request for seating, the food was terrific and they were knowledgeable and considerate of allergies identified. Highly recommend and will certainly return. Great place for a Sunday luncheon, beautiful views, food and excellent service. All four of us had the frittata for lunch which was very disappointing and ho-hum. Beautifully restored and wonderful atmosphere. You pay for the experience of the whole place. Dinner was beyond amazing and our server was fantastic. So attentive to detail. The atmosphere is wonderful however the food is lacking in flavour and the solarium is very noisy. The experience doesn’t live up to the bill yet. A great place for a special treat. Expensive.. $60 for 2 of us and my friend just had a plate of grilled veggies. Food is top notch and service excellent. Will go again for the view and the food, but only for a special treat. Classy, yet casual! Spacious dining area! Setting is one of kind! Dining room was perfect. My wife and I sat in a cozy booth in front of a wood burning fireplace. We loved the experience. Menu was OK. It seemed to lack originality, and prices seemed ambitious. $40 for a skirt steak was disappointing, and the pork loin was slightly over cooked and under seasoned. Presentation was 5 stars. Service was good. Our server was attentive to our needs, but lacked knowledge of the menu and did not provide any insight when we asked questions. Overall is was a good experience. Will return for a special night out as the dining room can’t be beat. But it won’t become a regular destination as there are other restaurants that provide better food for similar prices. We were really excited to dine at the Mill so maybe we were a little let down. Not to say this restaurant isn't wonderful. We were able to sit next to the window and watch the falls, which was a treat, but they keep it quite dark by the windows (obviously) and it was a little too dark for me. Our food was great, but not exceptional. The chef seemed to have a theme of lemon for the menu, and while I love lemon, the ravioli was a little overwhelming, and the salmon did not follow as well with the lemon. I'd recommend not getting both of these items. The terrine was a little bland. The salad was delicious. And I cannot recommend the Passionfruit cheesecake enough. I am mostly disappointed in cheesecakes, and this one makes me want to go back to town immediately. The waitstaff was pretty jovial and attentive. I was a little shocked by our waiter's rather zealous smack on my shoulder after telling a joke, but it was ok. Our wine selection, after requesting a full-bodied Italian, was not full-bodied. But it was ok. All in all, it was a nice experience, but they do have a couple areas to tighten up to make the experience match the price point. This was my first time and my wife's second in the restaurant . I enjoyed the view and the service and food was very good . We will be back for the dinner . Lovely lunch overlooking the gorge. Cocktails and food were delicious. Service was excellent.